Aurion Resources Ltd. and its partner B2Gold Corp. are pleased to report the initiation of its 2016 field exploration program in northern Finland. The 2016 field program entails field mapping, prospecting, surface geochemical sampling, trenching and drilling. The inaugural drill program will commence in late summer or early fall and will focus on the greater than 5000 m long Kutuvuoma trend (see attached map), which is the highest priority target area. A request for tenders has been submitted to several drilling contractors. Reconnaissance prospecting, geological mapping and trenching are also being conducted on several other targets within the JV area of interest during this field season. Additionally, following several months of data compilation and analysis, 78 specific exploration targets have been identified. The efforts of the 2016 field program will be to ground truth, expand and/or refine many of these targets. This includes Ahvenjarvi where to date a total of 384 rock chip/grab, and channel samples collected from outcrop, sub-outcrop, angular boulders and trenches over an area measuring 2,300m long and up to 700m wide, assayed up to 28.8 g/t Au and averaging 0.81 g/t Au. Mike Basha, President and CEO of Aurion commented: "We are very encouraged to have encountered such a robust and extensive gold system early in this program on the JV. Moreover, we are very pleased to have generated so many targets for additional follow-up elsewhere. We are looking forward to a very busy and exciting 2016, as we move this project forward aggressively with our partner B2Gold." The 2016 field program is fully funded by B2Gold Corp. ("B2Gold"), under an agreement whereby B2Gold can earn up to an undivided 75% interest from Aurion in a project area of approximately 25,000 hectares in Northern Finland by completing $15 million in exploration expenditures, a positive feasibility study and issuing 550,000 B2Gold shares (see Aurion news release of January 20, 2016 for details). On the 1st Anniversary (August 12th ) of the option and earn-in agreement, B2Gold will issue 100,000 B2gold shares to Aurion. In Q2, Aurion Resources was granted an additional 225,000 hectares of exploration licences prospective for precious and base metals in Northern Finland. The Kutuvuoma trend has very few natural bedrock exposures, however, with a limited amount of exploration work (and time in the field) trenching, soil sampling, base of till sampling and prospecting has defined an open-ended mineralized trend greater than 5 km long east and west of the Kutuvuoma deposit where only limited drilling was conducted in the past, over a distance of 175 m and to a depth of 175 m.
The Kutuvuoma deposit is a high-grade, shear zone hosted gold deposit that was discovered in the mid-1990's by the Finnish state entity Outokumpu Oy while exploring for base metals. Outokumpu drilled 47 shallow core and reverse circulation drill holes totalling 3,425m, testing only a very small area. Prior to Aurion no other exploration has been conducted since the mid-1990's. Numerous high-grade drill intercepts including 7.2 g/t Au over 19.4m from 60m downhole, 13.2 g/tAu over 5.0m from 88m downhole and 12.6 g/tAu over 7.0m from 26m downhole were recorded from the historical drilling. True width of the mineralization is estimated to be approximately 70-80% of drill intercepts. The best results to date came from Trench K15-02, a 310m2 excavation completed in 2015 located 370 m west of the Kutuvuoma deposit. A total of 31 individual 0.85m to 3.0m long channel samples assayed from 0.39 g/t Au to 63.1 g/t Au. The best length weighted average intervals reported were 6.5 g/t Au over 9.8m, including 11.3 g/t Au over 3.0m, 21.7 g/t Au over 3.0m, including 63.10 g/t Au over 0.9 m and 3.20 g/t Au over 10.9m, including 5.0 g/t Au over 5.6 m. The T2 excavation made approximately 100m east of Kutuvuoma Main, assayed on average 4.93 g/t Au over 10.94 m including 35.0 g/t Au over 1.2 m.
Prospecting in 2015 approximately 1.6 km to the west and along strike of Kutuvuoma identified a new zone of mineralization over a distance of approximately 400 m. The area is generally overburden covered, but 51 grab samples from outcrop and subcrop assayed up to 21.2 g/t Au, including four samples assaying 5.5, 11.6, 14.8 and 21.2 g/t Au. This mineralization also lies 500 m southeast of a 1.5 km long Au-in-till geochemical anomaly with individual tills assaying from up to 1.3 g/t Au. 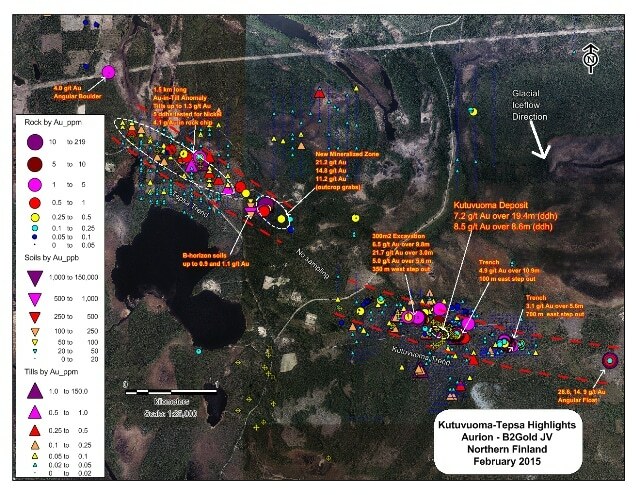 Preliminary metallurgical analysis of surface samples collected in 2015 from trenches 100 m east and 370 m west of the Kutuvuoma deposit were favourable. The metallurgical tests were undertaken to examine the response of two composite surface trench samples to various processes for the concentration and recovery of the contained gold and to get a general view of the project metallurgy. The response of the samples to whole ore cyanide leaching and to concentration by froth flotation and gravity separation was examined at by SGS Canada Inc. at their Lakefield Ontario laboratory. The samples responded well to all of the processes tested, with gold recoveries by a combination of methods in excess of 98% for both samples, including 80-84% recovery by gravity method alone. The material tested indicates the two areas tested would not require any treatment out of the ordinary. A much more extensive program would be required as the project develops.